​ & inspect the gun emplacements & the Battery Observation Post. 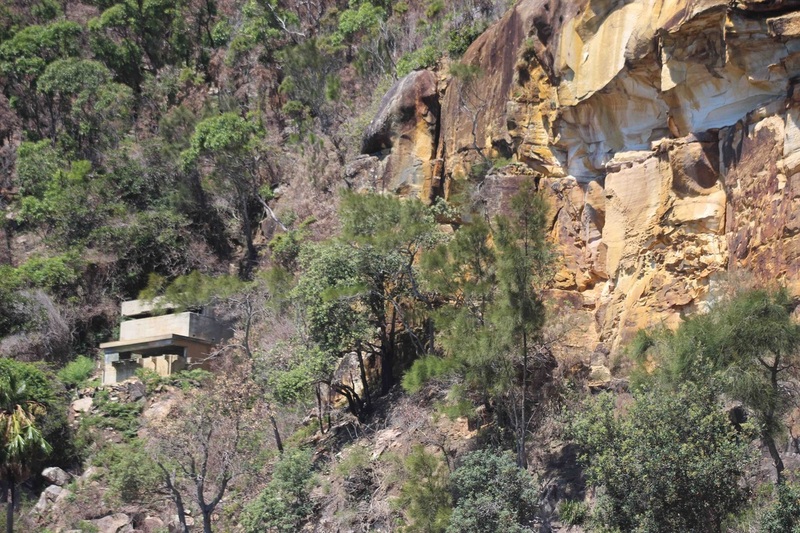 Between the mouth of the Hawkesbury River and Pittwater, is Ku-ring-gai National Park, here, below the cliffs of Commodore Heights lay the remains of an old defence complex that has become known as West Head Battery (WHB). Access to the site is extremely difficult and over the years the installations became overgrown, at the same time historical detail became equally ‘lost’. Gun Battery - it is the only dual 4.7” gun battery in Australia. 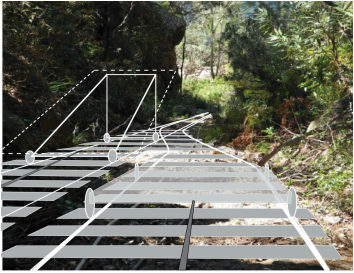 Inclined Railway - it is the only defence system in Australia that had an inclined railway to service it. 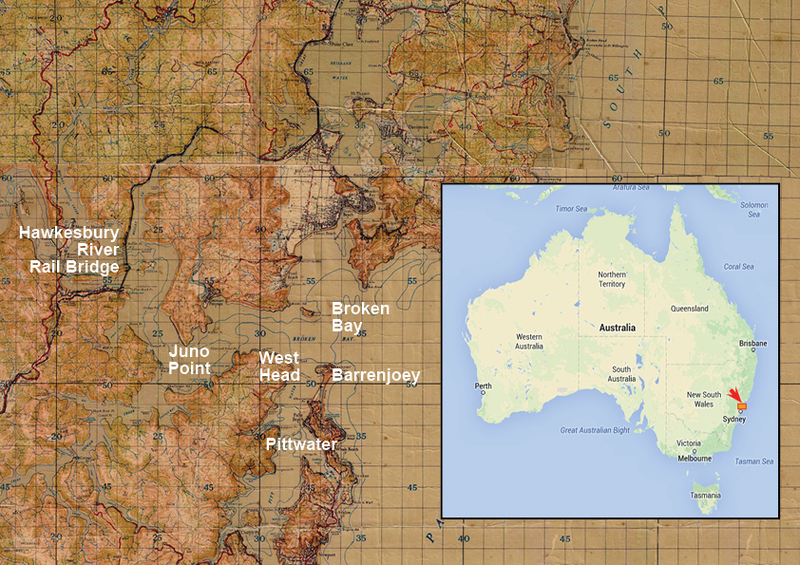 The Broken Bay, Hawkesbury River area, as shown on a WWII military map. Jack ‘Bluey’ Mercer, now aged 92, a veteran who was part of the army artillery team that installed the guns in 1941 and who has recently provided so much information. At the start of the second decade of the new Millennium, fate ﻿determined the time was right to begin research and bring the old 'Fort' back to life. 4HR's awareness of WHB first came about through a book recommended by Geoff Potter from Gosford Library, called 'Pittwaters War' by author Jim Macken. Jim's book also covered the 1942 Sydney Japanese Submarine Attack and subsequent submarine sightings in Broken Bay. 4HR became directly involved in 2012, due to the researching and the production of interpretive material about the submarine attack. Becoming aware of this, National Parks and Wildlife Service (NPWS) Central Coast/Hunter region, asked 4HResearch's secretary, Peter Rea to do some presentations on the subject. In reply to their 'Thank You' email for the presentations, the opportunity was taken to enquire about the West Head Battery (WHB). 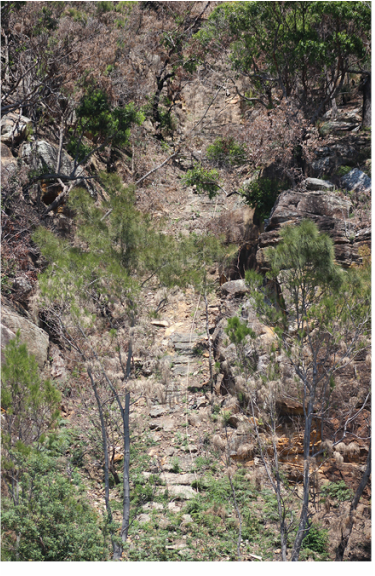 About the same time on the other side of the Hawkesbury River, Ku-ring-gai Chase National Park and National Park Wildlife Service Metropolitan North East Region's, Natasha Funke, was planning a hazard reduction burn around the WHF site and had commenced seeking information about it. She spent some hours of her own time at the State Library but came away with very little. Earlier that year a newly retired commercial pilot, Rohan Walter, had began volunteer work with NPWS at Barrenjoey Lighthouse. As he looked across Pittwater at what could be seen through the vegetation covering the old defences, he was reminded of sailing past the place as a youngster. He remembered a long stretch of concrete going from Commodore Heights to the water and being told it was once an inclined railway. These articles came about as a result of a discussion between two gunners over lunch in December 2009. Jack 'Bluey' Mercer asked the editor of 'Gunfire' magazine, Vic Rae, if he knew of West Head Battery. What followed was a great tale of the erection of a two gun coastal battery in 1941 on the shores of Broken Bay. This commenced a search for information that again led to Jim Macken's ‘Pittwater's War’ book, as well as access to some of his research materials. Bluey's story was then published in two issues of 'Gunfire'. By 2012 a community group had formed called the ‘West Head Awareness Team’ (WHAT), with Rohan as co-ordinator. It has been a pleasure for a number of 4HR members to become part of 'WHAT'. 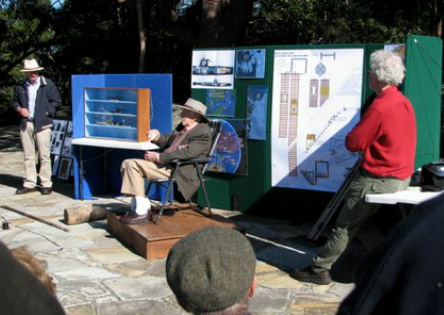 4HR first met ‘Bluey’ Mercer at Commodore Heights, West Head on the occasion of his 90th Birthday in January 2013. Working with only an old very basic electric cabling plan of the WHF which was considerably out of scale (it even showed an incorrect North), plus details provided by other 'WHAT' members, all was compiled into graphics massaged to fit and be superimposed on a modern aerial photo. in an area roughly 100m x 90m. seven buildings that provided living quarters, mess, shower block, offices and stores etc. adjacent to this was the head of the inclined railway which descends about 150m to end about 10m off the water. This inclined railway was met at the bottom by a horizontal railway which extended north on a gentle curve ending at number 2 gun. During May 2013 Heritage Festival NPWS and WHAT (with members of 4HR) combined for two information days. The illustration of the inclined railway can be seen on the display board. In picture, is 4HR's Peter Rea (right) who produced the drawing based on the descriptions by Bluey Mercer (centre) while Vic Rae (left) from RAA Assoc. 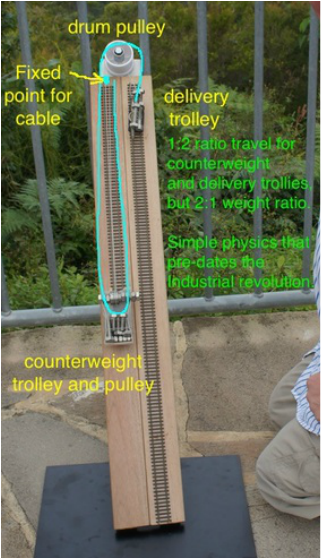 contributed by solving the problem of how the pulley system worked. Large numbers of people attended the information sessions over two weekends during the May 2013 Heritage Festival. Distinguished guests included Federal Member for Mackellar, Bronwyn Bishop and State Member for Pittwater, Rob Stokes. a further 20m north was a Picquet Hut that provided accommodation for that part of the garrison on duty at the guns, only the dry laid sandstone foundations of this building remain. 60m north of the Picquet Hut is Number 2 Gun at this point the horizontal railway ends. 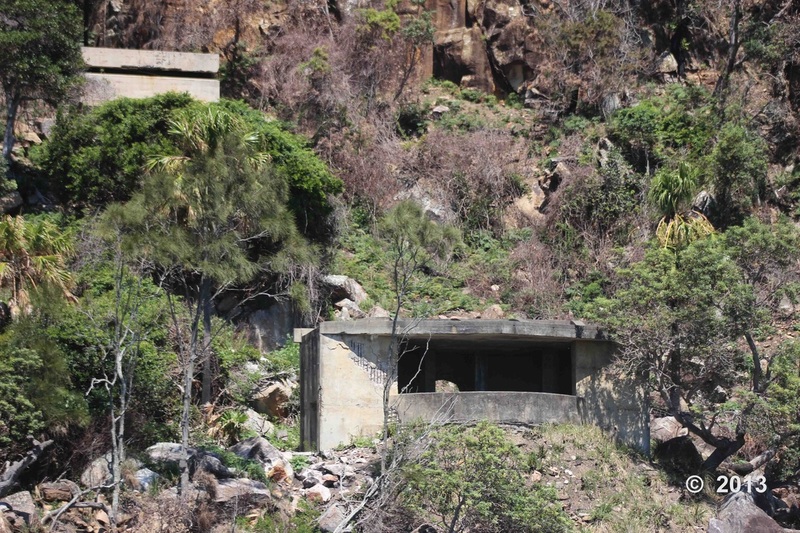 About 30m directly behind number 2 gun, near the cliff face is a two storey concrete Battery Observation Post. The whole area is about 185m long. Beyond the main area about 160m north is the Northern Searchlight Position, the remains of this building consist of a of steel frame, a roof of thick timber planks with waterproofing on top and corrugated iron sides. The Southern Searchlight Position is about 50m from the bottom of the inclined railway in the opposite direction. The concrete building that housed the light has had it’s roof crushed by a falling boulder. To the south of the southern searchlight was the anchor point for a steel net that extended across Pittwater to Barrenjoey. Power and communications came to the WHF via underwater cable from Pittwater. Further to the south, below what appears to be a concrete guard post is evidence in the rocks of a jetty, the use of which must have been extremely difficult because the water is usually very choppy. Nothing is left to determine how the railway actually looked and despite best efforts no official drawings or plans have come to light. Utilising Bluey Mercer's excellent memory, 4HR's Peter Rea started to produce a technical drawing of the railway. We knew there were no motors or winches, the railway was worked by ‘weight and counter-weight’, the counter-weight trolley had a three and half ton concrete block attached. There were two parallel railway lines, the transport line was about 150m long, the counter-weight line was half that length…so how did that work? At first it was thought that by the rope passing around the head wheel two and a half times, this provided a 2:1 ratio, but once the first drawings were done the fallacy of this proposal became obvious. Then it was thought a gauntlet rail system might have been used with the counter-weight line diverging on the main line via a set of points and so 4HR produced the concept graphic (top right). Vic Rae (Royal Australian Artillery Assoc. NSW) finally came up with the solution which, in hindsight, was so simple but that had everyone bamboozled for so long. The wire rope was anchored at the top of the cutting and then passed around a pully attached to the counter-weight before returning to the top of the cutting to pass around the head wheel and so....Tar-Dar! a 2:1 gear ratio was the result. A wire rope was anchored at the top of the rail line and came down to pass around a pulley on the counter-weight trolley. This rope returned to the railway head and passed two and a half times around a grooved 2m diameter wheel, this wheel was horizontally mounted. The rope then went down to attach to the supply trolley, the weight of the load would take this trolley down and once unloaded, the counter-weight would pull it back to the top. The descent was controlled by a braking system on the 2m wheel, this consisted of four wooden blocks connected by a threaded bar and applied by a 30cm hand wheel. 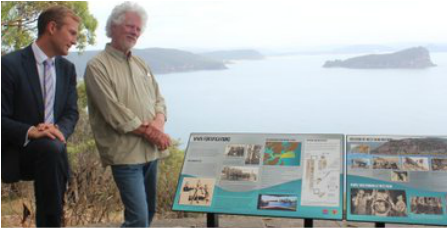 In Nov. 2014 NSW-National Parks & Wildlife Service (NP&WS) invited 4HR to the unveiling of interpritive signs at West Head by Minister for Heritage, Rob Stokes. Much of the artwork on the signs was produced by Peter Rea from 4HR, with invaluable input from Bluey Mercer, Vic Rae from RAAA (NSW) and Rohan Walter (WHAT). An opportunity arose to speak to Minister Stokes about taking the drawings of this unique Australian site to the next steep...building working models! This is something which has been considered for some time, two working models of the inclined railway. one using its original working principles and the other a working model the site, powered by electric motor. Mr. Stokes suggested the 4HR proposal be sent to his office for due consideration. A relatively short time later we received notice that the Office of Environment & Heritage and NP&WS - Metro Region would jointly assist to finance the production of the models. Without delay we spent a good few hours searching all over the world via the net for suitable parts. This was followed by exchange of numerous emails to suppliers to gain more details to ensure the parts would be suitable. Although 4HR was (and still is thanks to undue short falls and delays in receiving Federal Government funds) up to it's eyeballs in the Anzac Centenary projects, this light horseman took time off from 'Beersheba' to check out some of the parts for the WHB railway; a timber frame, planked top, pewter axle boxes, brass bearings, beautifully turned steel wheels brass three link coupling and brass pins to hold everything in place. 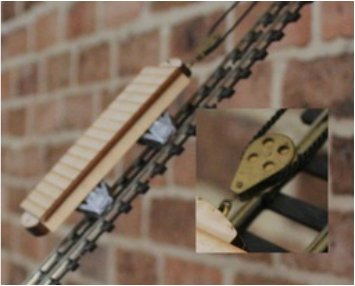 The brass pulley (picture below) for the load-trolley and the pulleys for the top of the line to feed the rope onto and off the wheel, were sourced in Australia. deadline fast approaching we would definitely, absolutely, cross our hearts, not start any work on the West Head Battery, Inclined Railway until May 2015. Well that didn't work... and two days later the counter-weight trolley was completed, the brass pulley is a delight! 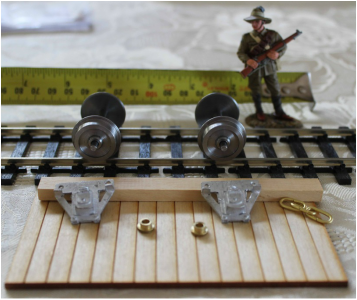 after the boys from the Men's Shed put the final touches to the base board of 4HR's 'WWI Western Front - Advance Across No-Mans-Land' diorama, Doug got stuck into the base for the O gauge model. The O gauge model was then delayed due to problems getting the necessary components from England. The N gauge working model, however, apart from a few small details was finished at the end of July 2015. From June 2015 until November the model was displayed at Henry Kendal Cottage & Museum, West Gosford. There it was part of the museums temporary 'Solder On' exhibition, along with 4HR's HMAS Sydney I, HMAS Swan I, 'The Sydney Submarine Attack' and 'The Battleships Bismarck and Yomato Compared'. All up 17 detailed scale models and lots of specially prepared graphics were presented by 4HR. A 4HR member was on hand most open days to provide additional information about their display subjects. Above: Everyone involved with the WHF project is passionate about it. The 2014 WHF event saw the amount and quality of the displays improve, plus it gave the public a chance to descend down the inclined railway cutting with a professional abseiling group. Left: 2014 also offered the opportunity to 'rappel' down the old inclined railway line for a guided tour of the installations. Above: One of the latest of the two WHF graphics 4HR is currently working on, this is a hand rendered computer graphic of one of the 4.7 inch guns. 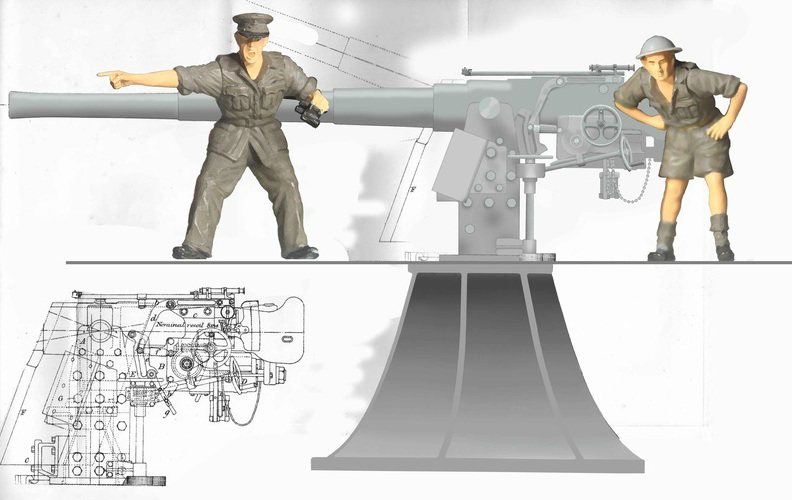 This gun will be part of a cut-away view inside number 2 gun position, the illustration of the actual gun (as shown) is about 80% complete. A full compliment will be added to the gun layer and an officer shown . Vic, editor of 'Gunfire' newsletter for the Royal Australian Artillery Assoc. (NSW) has provided technical assistance for this graphic. Rohan Walter, Natasha Funke, Jim Macken and John Illingsworth. receiving their 2014 NSW Heritage Award.